Should you give fake flowers to a girl? Goodness, NO! it may potentially upset her. are you trying to imply she is fake or the love is fake? 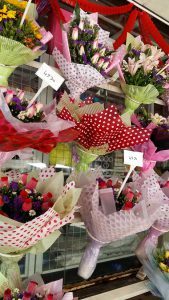 most girls would rather get real flowers and even though the flowers are going to fade, the sentimental ones would dry press the flowers to be used for decoration, scrapbooking or kept in their diaries. A small monitory of girls may not mind plastic or fake flowers, but you would not know for sure so it is better not take the chance. Even for plastic flowers sold in shop, the quality in most shops are of inferior quality and makes the whole bouquet looks cheap. The above is sold at a shop in Petaling Street which uses better quality plastic flowers. Overpriced Real Flowers on Valentines and the alternatives…. On Valentine’s Day, of course the flowers are grossly overpriced. The money could have been well spent on a candelight dinner (surprisingly many restaurants do offer packages for Valentine which is can be reasonable). 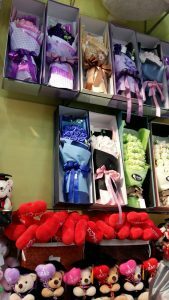 Perhaps a single or a few symbolic stocks of roses wrapped in a nice ribbon with the optional a soft toy would suffice followed by a nice dinner. If you are getting flowers, ensure you order them early to avoid out of stock. For the above, the chocolates are wrapped using decorative wrapper so it is not brand sensitive. The above is the Ferrero Rocher bouquet.